Posted by Madeline Patton on April 2nd, 2018 at 2:00pm . Eight experts on student recruitment and retention including Donna Johnson, whose Guaranteed 4.0 study skills method that has helped many students succeed, will be featured in the 2018 STEM Success for Women Telesummit. The free online conference that aims to empower educators to recruit and retain more women in STEM will air for two hours each day on April 17, 18, 19, 24, 25 and 26 with the support of the National Science Foundation’s Advanced Technological Education program. To register for the telesummit go to http://www.iwitts.org/stem-telesummit#register. Mark Evans is one of six community college educators who will provide a “boots-on-the-ground perspective” of effective practices for recruiting and retaining women in STEM programs at two-year colleges. Evans credits iWITTS’s WomenTech Educators Online Training and coaching from Donna Milgram, iWITTS executive director, with helping him attain 45% female enrollment (63 of 140 students are women this semester) in the Emerging Technology associate degree program at Athens Technical College in Athens, Georgia. Broward College students, faculty, administrators, and staff worked together on a hackathon in October 2017. The hackathon and Women Who Code club are among the recruitment and retention activities the college in Fort Lauderdale, Florida, initiated as a result of iWITTS’ WomenTech Educators Online Training. In spring 2015, three of the 10 students in the then-new Emerging Technology program were women. 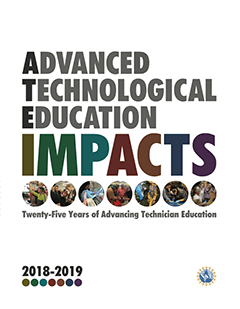 While 33% female enrollment was respectable, Evans said the WomenTech Educators Online Training that he and Athens Technical College colleagues began taking that semester shifted recruitment efforts beyond the 18 to 30-year-old males who typically enroll in technology programs. Requiring colleges to involve teams of administrators and faculty in the online training and to focus on just one program are among the changes iWITTS (Institute for Women in Trades, Technology & Science) made during its current ATE grant. These changes have resulted in 75% of the participating colleges improving their recruitment and retention rates. The online training comes with five-and-a-half hours of institution-specific coaching that Milgram says helps colleges launch well-planned strategies that improve student outcomes within a year or less. Evans considers Milgram’s advice to recruit students already enrolled at the college as key to Athens Technical College’s success. She encouraged him to ask all the college’s deans for permission to recruit informally among their prospective students. He started by asking the Life Sciences dean, who readily agreed because he wanted the college to retain students who do not have the high GPAs required for nursing and other healthcare programs. So Evans began visiting the students’ dining area at lunchtime with a robot, striking up conversations, and telling students about technology careers that would be options for them if their “Plan A falls through.” Evans said men usually asked him about the equipment’s capability while women asked him what robot operators do and how much they are paid. “They want to see what they can do to progress,” he said of the female students. In fall 2015, 15 of the 17 new students in the Emerging Technology program were women. Evans has since grown overall enrollment and participation among women by putting other technologies that are covered by the program—3-D printing, drones, video game design, and mobile phone apps—in students’ hands during open labs and at campus events. The recruitment plan the Athens Technical College team developed for the Emerging Technologies program focuses on attracting young adults who have not declared a major. “We’re trying to help them find what it is they want to do in STEM-related field and then give them a basis so that way they can go on and get more education or go straight into the job market,” Evans said. He recalls helping one woman overcome her nervousness about possibly crashing the drone by telling her he would show her how to fix it if she broke it. Evans also credits the WomenTech Educators Online Training with prompting him “to think about my practice and my craft through a very different lens.” As a result he’s less aloof and welcomes students purposefully. He also invests time in helping students stay on track in the program. Being more mindful has meant modeling the behaviors that he hopes students will use in the workplace. The group assignments he has developed intentionally build students’ soft skills. “Everyone works together to try to get through,” Evans said, adding that he has had only a few male students and no female students drop out during the past three years. Women in particular appreciate the real-world experiences, like creating mobile apps for non-profit organizations, that are woven into the curriculum, he said. “A lot of the change that we want to see in our culture, especially business culture, starts here. It starts with me and my program and building these ideas that people need to be treated equally,” Evans said. Milgram, who has worked on improving women’s lives for 25 years, said “The two-year college space is a really important space to impact” because more than half the students who attend two-year colleges nationally are women; 47% are from minority populations; and the majority of students with disabilities enrolled in higher education attend two-year colleges. Other data indicate that preparing women, people of color, and individuals with disabilities for middle-skill careers through associate degree and certificate programs in advanced technology fields improves their earning potential and diversifies the STEM workforce. “It actually makes a difference in many of the things we call women’s issues—they start to go away—if we have women working in full range of career paths. Plus it’s more fulfilling for them,” Milgram said. While the most progress in closing the wage gap between men and women has happened at the professional level, Milgram points out that most people do not go on to graduate school. The STEM careers that are the focus of initiatives supported by the ATE program pay wages that help people become economically self-sufficient.